Book of Mormon Evidences, Part One discusses some of the many factors supporting the plausibility of the Book of Mormon as an ancient document. It is part of a collection that includes Book of Mormon Evidences, Part Two, Book of Mormon Evidences, Part Three, and Book of Mormon Nuggets. Contrary to the claims of our critics, there are many interesting findings that make it difficult to explain away the Book of Mormon as a nineteenth-century fraud from Joseph Smith. Such evidence is not "proof" but should encourage readers and seekers of truth to give the Book of Mormon a chance. These pages are maintained by Jeff Lindsay, a Book of Mormon aficionado, who takes full responsibility for the statements and opinions offered on this page. This page is neither sponsored nor endorsed by The Church of Jesus Christ of Latter-day Saints. This page is the work of Jeff Lindsay of Appleton, Wisconsin (now living in Shanghai, China since 2011). I served an LDS mission in the Switzerland Zurich mission and have held a variety of Church callings. However, don't blame the Church for any errors here: I write, ramble, and stumble on my own. Not that it matters, but I have a Ph.D. in chemical engineering from BYU, I'm registered U.S. patent agent, I love science, inventing, photography, writing and learning. Professionally, I have been in academia and corporate research and development, have many technical publications and patent, and have been active in IP and innovation strategy. Mormanity is my LDS blog, in operation since 2004. Numerous Book of Mormon issues have been discussed there. Also see The Mormon Interpreter, the Neal Maxwell Institute, FairMormon.org, and SHIELDS. You can order a free Book of Mormon at Mormon.org. Parts of this page are translated into Spanish: see Evidencias del Libro de Mormon by Marco Royo. Mulek, Son of King Zedekiah? "The Land of Jerusalem"--a fatal blunder?? Stylometry or "Wordprint" Analysis: Was Joseph Smith the Author of the Book of Mormon? I assume that you are already familiar with what the Book of Mormon is. If not, please see my Introduction to Book of Mormon. The purpose of the Book of Mormon is to convince the world that Jesus is the Christ, our Lord and Redeemer. It was written by prophets anciently, preserved, and translated in our era by the power of God as a tool to bring souls to Christ. Intellectual evidence of Book of Mormon authenticity is an issue worthy of careful consideration. However, intellectual evidences on their own do not change lives and bring souls to Christ--that requires a spiritual witness through the power of the Holy Ghost. Nevertheless, intellectual evidences can be valuable in opening minds and strengthening one's spiritual testimony of the truth. I am greatly impressed with the evidence of Book of Mormon authenticity, especially factors that seemed like laughable mistakes in 1830 that now have become powerful witnesses that the Book of Mormon is what it claims to be -- an authentic ancient document that Joseph Smith DID NOT write. He translated it through the power of God. The evidences discussed here and on related pages support the notion that the Book of Mormon is not a clumsy fraud that a poorly educated man or even a group of scholars could have concocted in the early 1800s. Rather, it displays extensive ancient roots and has the uncanny trend over time of its weaknesses becoming strengths. Things that seemed ridiculous when it was published or even up until a few years ago suddenly become impressive evidences for authenticity, such as the many issues related to the Arabian journey in 1 Nephi. Given its miraculous and even preposterous origins, such evidences are unexpected and demand further inquiry, as Robert F. Smith carefully explains, with a mountain of intriguing evidences along the way, in his paper, "The Preposterous Book of Mormon: A Singular Advantage," lecture, August 8, 2014, at the annual FAIRMORMON Conference, Provo, Utah, a fascinating read. Book of Mormon Authorship: New Light on Ancient Origins, edited by Noel B. Reynolds (Provo, Utah: Foundation for Ancient Research and Mormon Studies, 1996). Contains essays on many topics such as chiasmus, wordprint analysis, etc. One good example is Eugene England, "Through the Arabian Desert to a Bountiful Land: Could Joseph Smith Have Known the Way?," pp. 143-156. Reexploring the Book of Mormon, edited by John Welch, Deseret Book Comp., Salt Lake City, UT, 1992. Short and powerful summaries of new research over the past decade or so on the Book of Mormon. Rediscovering the Book of Mormon, edited by John L. Sorenson and Melvin J. Thorne, Deseret Book Comp., Salt Lake City, UT, 1991. Twenty-three chapters by various authors exploring different aspects of the Book of Mormon, including the topics of language, especially chiasmus and Hebraisms; society, politics, and war; original authors and their sources; and unifying themes. The Book of Mormon and DNA Research by Daniel C. Peterson. A compilation of contributions from scientists and other experts. The Book of Mormon and Other Hidden Books: Out of Darkness Unto Light by John A. Tvedtnes. Many fascinating topics, insights, and evidences. King Benjamin's Speech: "That Ye May Learn Wisdom" by Stephen D. Ricks, and John W. Welch. The ancient aspects of this speech are strong evidence that it could not have been fabricated by Joseph Smith, in my opinion. V. Garth Norman, "Joseph Smith and the Beginning of Book Of Mormon Archaeology: Did the Prophet Joseph Smith in 1842 Locate Book of Mormon Lands in Middle America? Brant Gardner, "From the East to the West: The Problem of Directions in the Book of Mormon"
Matthew Roper, "Joseph Smith, Revelation, and Book of Mormon Geography"
John E. Clark, "Evaluating the Case for a Limited Great Lakes Setting" (PDF). While faith will always be required in our mortal journey, for those interested in moving forward on faith's rocky path, there are occasional dazzling lights along the way to help us see our way around or over the obstacles we face. Some of the brightest lights giving intellectual support to the Book of Mormon come from the Old World, particularly the Arabian Peninsula, where dramatic finds have added new levels of credibility to the account in First Nephi. Glaring weaknesses have suddenly become strengths, including the impossibility of finding a "continually running" river (1 Nephi 2:9) in Arabia or an incredible place like Bountiful in a land rich in oil and sand but nothing like the verdant treasure of Nephi's account. Jeff Lindsay, "Joseph and the Amazing Technicolor Dream Map: Part 1," The Interpreter, April 2016. Here I take on some of the most recent and fairly sophisticated criticisms of the evidence for Lehi's Trail in a peer-reviewed publication. Also see Part 2, where we get into details of the maps in Joseph's day and what they could have told Joseph. Warren Aston's "Across Arabia with Lehi and Sariah: 'Truth Shall Spring Forth Out of the Earth,'" Journal of Book of Mormon Studies, vol. 15, no. 2 (2006), pp. 8-25, along with other great articles and photos related to the Arabian Peninsula. This one link is a motherload of info on the Arabian Peninsula evidences for the Book of Mormon. Share it easily with this shortcut: https://tinyurl.com/arabianevidence. Overview: The Book of Mormon describes an ancient journey through the Arabian peninsula with plausible details such as directions, a verified ancient place name, geographical details, and the description of an unexpected place called Bountiful that now also appears to be verified. These details could not have been fabricated based on what was known in 1830--even modern "general knowledge" of the Arabian peninsula would not allow a typical educated adult to provide the confirmed details in the Book of Mormon. The only plausible explanation for this is that the author of First Nephi, the book containing the account of the ancient Arabian trek, actually made that trek. The most logical candidate for authorship of First Nephi is Nephi, not Joseph Smith. The Book of Mormon begins in a well-known location, Jerusalem, in 600 B.C. The book of First Nephi, the first book in the volume, describes the actions of Lehi and his family in leaving Jerusalem before its destruction, following the counsel of the Lord, and wandering through the wilderness for several years before embarking on a transoceanic voyage to somewhere in or near Central America. Several hints are found in the text that provide information about the journey through the Arabian Peninsula--information which proves to provide powerful evidence for the authenticity of the Book of Mormon. Following the exodus of Lehi and his group from Jerusalem, they passed near the Red Sea, traveled "south-southeast" (1 Nephi 16:13), roughly parallel to the Red Sea or near its borders (1 Nephi 2:5, 1 Nephi 16:14), until they reached Nahom (1 Nephi 16:34), where Ishmael was buried. (Ishmael was the father of a family that fled Jerusalem with Lehi's family, whose daughters became wives to Lehi's sons.) There was considerable mourning at Nahom. After a while, they traveled eastward (1 Nephi 17:1) until they reached a place they called Bountiful (1 Nephi 17:5) on the coast of the Arabian peninsula, described as rich, green garden spot with trees, abundant fruit, water, honey, and a mountain. At this wonderful site they stayed at least long enough to construct a ship from the abundant timber. Metal obtained from ore was also used to make tools. The description of Lehi's journey through the desert has been attacked in anti-Mormon literature. Finding a garden spot on the coast of the Arabian peninsula was laughable and was laughed at in the 1800s, because nobody knew of a place that could come anywhere close to being a candidate for Lehi's Bountiful. Indeed, recent anti-Mormon books continue to mock the possibility of a place like Bountiful existing. "The Arabian desert does not have luscious garden spots: Joseph Smith blew it. Case closed." Today we are in a much better position to assess Lehi's journey. It comes as no surprise to me that the journey described in the Book of Mormon now has substantial support behind it. No garden spots in the Arabian Peninsula? Enjoy these scenes from the coast of Oman, used with kind permission from the official site for the Ministry of Information of the Sultanate of Oman, Omanet.om (archived). Go to their site and click on "gallery" and then "tourism," and then click through their photos. Amazing views, though these are not at the precise locations for the leading Bountiful candidates, but only in the broad region. After rain in the Dhofar region of Oman. Note the trees. 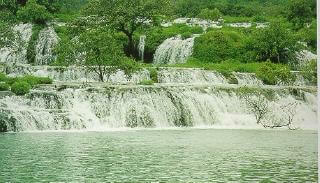 A view in Salalah, another candidate region for Bountiful in Oman. First, an analysis of the ways of the desert Arabs shows remarkable consistency with the actions taken by Lehi's group and with the language and metaphors used by Lehi as he spoke to his family while traveling in the desert (well covered in Hugh Nibley's Lehi in the Desert ). His general path along the Red Sea also follows what are now known to correspond with the ancient frankincense trails in Arabia, which were major trade routes. (See an online map at Latter-day.com of the proposed route, or a group of maps at NephiProject.com. Also see K.C. Kern's satellite map showing the locations of Nahom and Bountiful at BookofMormonOnline.net.) And, as discussed elsewhere on this page, an excellent candidate location has been found for the Valley of Lemuel and the River of Laman--so excellent and amazing, that critics will be ignoring this issue for years to come. But thanks to the explorations of the Astons in Yemen and Oman, and more recently the work of George Potter (the force behind the Nephi Project--see www.nephiproject.com), we now know much more. As the Astons show in their book, the many details of Lehi's journey in the Book of Mormon can be given solid plausibility based on modern discoveries. For example, the Astons show that there is indeed an ancient site called Nehem that is south-southeast of Jerusalem which was on the frankincense trail and has an ancient tradition of being a place for burial and mourning. Ancient tombs are still abundant in that area. The name Nehem/Nahom ("nhm"--which can also be rendered "Nihm") is a rare place name--with the only known site in the Arabian peninsula being at a place consistent with the Book of Mormon account. Along with detailed documentation and references, the Astons' book includes a photograph of the 1976 Royal Geographical Society map--apparently from the University of Sana'a in Yemen--showing Nehem as a significant burial site in the right place to agree with the Book of Mormon description of Nahom. The existence of this site was not known to LDS scholars until a few years ago and certainly could not have been known to Joseph Smith. By the way, the Semitic name Nahom can refer to mourning and consolation, and may also refer to groaning and complaining, giving it special significance in Nephi's account as a possible Hebraic wordplay. See 1 Nephi 16:35. See Stephen Ricks, "On Lehi’s Trail: Nahom, Ishmael’s Burial Place" for details on the meaning of Nahom, which involves another interesting Hebraic wordplay. "A German archaeological team under the leadership of Burkard Vogt has been excavating the Baran temple in Marib, the ancient capital of the Sabaean kingdom that lies about 70 miles due east of modern Sana, the capital of Yemen. (It is likely that the queen of Sheba began her journey to visit King Solomon from Marib.) Among the artifacts uncovered at the temple, the excavators turned up an inscribed altar that they date to the seventh or sixth centuries B.C., generally the time of Lehi and his family. A certain "Biathar, son of Sawad, son of Nawan, the Nihmite" donated the altar to the temple. the altar has been part of a traveling exhibit of artifacts from ancient Yemen...."
Impressive evidence from three inscriptions on ancient altars from Yemen has been discussed by S. Kent Brown (see "On NAHOM/NHM"), who notes that inscriptions from ancient altars in Yemen soundly demonstrate the existence of the name "NHM" in a time and place consistent with Nephi's account of the place Nahom. See also my Book of Mormon Nugget #15, "More Support for the Place Nahom", "The Arabian Bountiful Discovered? Evidence for Nephi's Bountiful" by Warren P. Aston, and Warren P. Aston, "Newly Found Altars from Nahom," Journal of Book of Mormon Studies 10/2 (2001): 56-61). The previous link is to the PDF version of the article, which is a must-read. There is simply no question that "Nahom" in the Book of Mormon now has solid support--a direct hit in terms of Book of Mormon evidence. The critics have tried to dismiss this evidence, making some serious errors along the way. See "Book of Mormon Minimalists and the NHM Inscriptions: A Response to Dan Vogel" by Neal Rappleye and Stephen O. Smoot in the Mormon Interpreter. Also see my response, "Noham, That's Not History (Nor Geography, Cartography, or Logic): More on the Recent Attacks on NHM." As one travels south-southeast of Jerusalem along the major trunk of the ancient Arabian trade route, the route branches east toward the southeastern coast at only point: in the Jawf valley (Wadi Jawf) just a few miles from Nehem. From thence the eastern branch of the trade route goes toward the ancient port of Qana--modern Bir Ali--on the Hadhramaut coast, where most of the incense was shipped. This eastern branch was the major route--the pathways to the south were less used. Now if Nehem is the Book of Mormon site Nahom, then is there a Bountiful to the east of it on the coast? 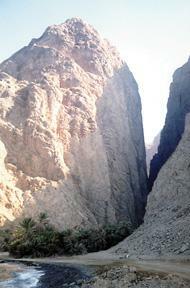 Amazingly, we have the luxury of two excellent candidate sites that are roughly due east of Nehem on the Oman coast. The Astons propose Wadi Sayq as the best candidate for Bountiful, and it impressively fits the criteria that one can derive from the Book of Mormon. It is a most unusual seashore site which appears to meets virtually every criterion for the site Bountiful in the Book of Mormon. 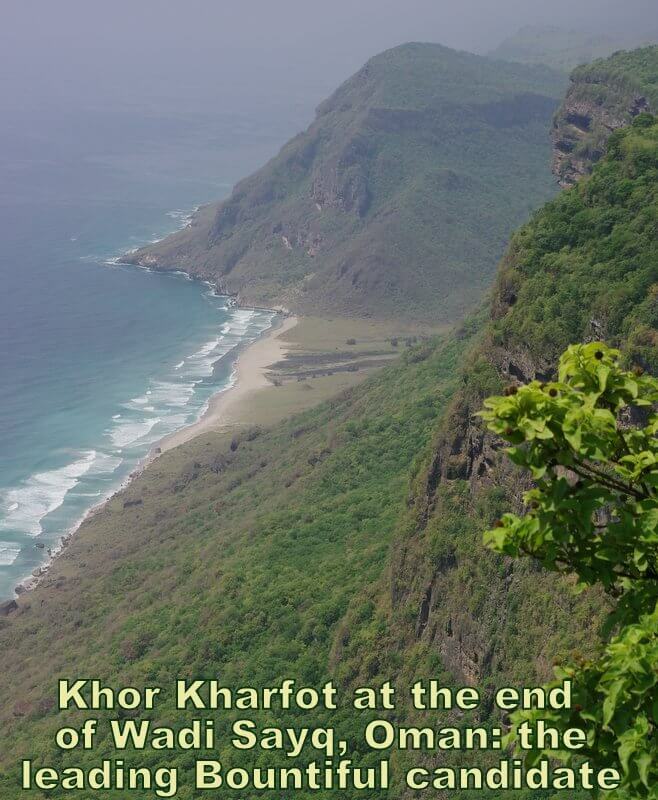 George Potter proposes the ancient port of Khor Rori as the general site for Bountiful. It meets many but not all of the criteria that Wadi Sayq does, lacking a suitably near "mount" that Nephi often went to and not being suitably fertile and green to make a convincing Bountiful, in my opinion. Aston also makes plausible arguments that the text requires Bountiful to have been uninhabited, which best fits Khor Kharfot at Wadi Sayq. The Astons make an impressive case and clearly show that the book of First Nephi could not have been fabricated by Joseph Smith. Their candidate site of Wadi Sayq appears to offer almost all that we could hope for in terms of marvelous, even stunning evidence in favor of the Book of Mormon. Their work is further supplemented by the photographic work of Maurine and Scot Proctor, reported in the article, "Where Did Nephi Build the Ship?" from Meridian Magazine, Sept. 30, 2000. The Proctors provide some additional details beyond the work of the Astons that show the plausibility of the Wadi Sayq location. The NephiProject.com site also provides a page of maps, including a map showing a proposed route for Lehi's trail with a candidate for the Valley of Lemuel, as well as Nahom/Nehem and an alternative good candidate for Bountiful not far from the one proposed by the Astons. Also see "Where Did Nephi Build His Ship?" by Rex Jensen at Latter-day.com, discussing additional tentative evidence for Wadi Sayq as a candidate for the Bountiful site from which Nephi sailed. As for the challenge of sailing from Bountiful to the New World, see "Is This the Wind that Blew Nephi to the Americas?" by Warren Aston. The weather phenomenon known as El Niña could have done the trick, perhaps.Also see my Mormanity blog post, "Warren Aston on the Superiority of Khor Kharfot as a Candidate for Bountiful." Also see "Finding Nephi's Bountiful in the Real World" by Warren P. Aston, where he offers some arguments against the Khor Rori site, and see the blog for Discover Nephi's Bountiful. Salalah near Khor Rori appears to offer much more in the way of fruit and timber than does Wadi Sayq, but this is largely due to recent irrigation. Khor Rori does provide a good harbor with an ancient tradition of ship building, but there is no evidence that ship building skills were there anywhere close to Nephi's time. 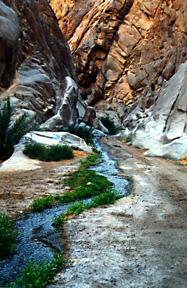 Wadi Sayq, on the other hand, offers an inlet that anciently may have been quite suitable for launching a ship. At Khor Rori, Potter argues that Nephi could have learned the art of ship building, could have learned how to outfit and operate a ship, could have learned how to train a crew, could have done practice runs in the harbor so his family could see that it was a good ship, could have used existing moorings and literally had his family do down into the ship, and so forth. But Wadi Sayq has all the elements of Nephi's story--the mountain, the trees, the place to build a ship--all close together. It was very fertile, with much fruit and honey, possibly game (1 Nephi 17:5,6; 1 Nephi 18:6). Ore and flint were available (1 Nephi 17:9-11,16). Wadi Sayq appears to be the most compelling fit. The mountain for Khor Rori/Salalah, for example, isn't really close enough and overlooking the depths of the sea as the mountain at Wadi Sayq. Both sites are relatively close, within a journey of about two days on foot. Ore has been found at both sites. Khor Kharfot at Wadi Sayq offers the largest body of coastal fresh water on the Arabian peninsula, with a beautiful freshwater lagoon, visible on the color photo on the dust jacket of the book "In Lehi's Footsteps." Wadi Sayq has dates, honey, and several species of trees, such as the sycamore fig and tamarind, that may be suitable for ship building. Both sites have coastal areas ideal for an encampment on the seashore, and it is accessible from the interior desert. In the Aston's book, you'll see trees, greenery, mountains, cliffs, etc., that bring Bountiful to life. While there are two interesting candidates, I strongly favor Wadi Sayq, and this appears to be the general consensus of LDS scholars and of those who have visited both sites. But the very fact that anything remotely close to a plausible candidate exists is in stark contrast to the oft-repeated claims of critics of the Book of Mormon. 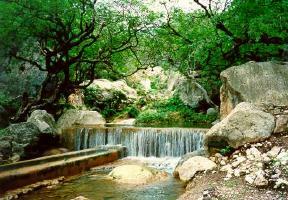 An official Web site from the Sultanate of Oman now provides a photogallery with some beautiful photos that show some of the remarkable scenes from the Omani coast, including some of the lush, green vegetation and large trees that occur near candidate sites for Bountiful (Dhofar near Wadi Sayq, and the sites of Salalah and Khor Rori). You can also see the harsh desert. The site is Omanet.om. After going there, click on "gallery" and then "tourism," and click through their photos. Beautiful. Incidentally, the recent discovery of iron ore suitable for tool making using wood-fired furnaces in the region of Bountiful is a far more impressive find than one might realize, for there are very few places in the Arabian Peninsula that have such ore, according to geology professor Ron Harris in his fascinating article, "Geologists Discover Iron Ore in the Region of Nephi's Bountiful" in Meridian Magazine at LDSmag.com. His article discusses the significance of the find and confirms that the iron ore near the area can be converted to workable metal using wood-fired technology. By describing in such precise detail a fertile Arabian coastal location, as well as the route to get there from Jerusalem (complete with directions and even a place-name en route), Joseph Smith put his prophetic credibility very much on the line. Could this young, untraveled farmer in rural New York somehow have known about a fertile site on the coast of Arabia? Could a map or some writing other than the Nephite record have been a source for him? The answer is a clear no. Long after the 1830 publication of the Book of Mormon, maps of Arabia continued to show the eastern coastline and interior as unknown, unexplored territory. In fact, until the advent of satellite mapping in recent decades, even quite modern maps have misplaced toponyms and ignored or distorted major features of the terrain. There is simply no way that Joseph could have obtained enough information about Arabia to fabricate more than a minute fraction of the voyage described in First Nephi. This is demonstrated in the survey of information available prior to 1830 provided by Eugene England in "Through the Arabian Desert to a Bountiful Land: Could Joseph Smith Have Known the Way?," in Book of Mormon Authorship: New Evidences of Ancient Origins, edited by Noel B. Reynolds (Provo, Utah: Foundation for Ancient Research and Mormon Studies, 1982), pp. 143-156. Also see S. Kent Brown's excellent response to critics who have challenged the significance of finds in the Arabian Peninsula dealing with the place Nahom. Also see his article, "On NAHOM/NHM." It is true that the name "Nehhem" or "Nehem" appear on a couple of maps of Arabia produced in Europe before the Book of Mormon was published (see In the Footsteps of Lehi, pp. 14-17). Danish explorer Carsten Niebuhr prepared a map in 1763 and published a book in 1792, that was translated into English and published in England, dealing with the Arabian Peninsula. I discuss this an other maps in my article, "Joseph and the Amazing Technicolor Dream Map: Part 1" and "Joseph and the Amazing Technicolor Dream Map: Part 2." It would have been essentially useless to someone trying to fabricate the Book of Mormon -- there is no hint that any of the limited information on that map made it into the Book of Mormon. Also of interest is a French map produced by Rigobert Bonne around 1780, which shows "Nehem" on the map (see related old maps of Arabia by searching for "Arabia" in the maps at Portsmouthbookshop.com. In fact, Jim Gee has completed an extensive study on maps of Arabia, "The Nahom Maps". That link is to the text version. There is a low-resolution PDF showing the maps he discusses, but for best results, see the much larger high-resolution PDF version of Gee's article (110 MB!). Gee found that some of the most expensive maps from the finest printing houses in Europe between 1751 and 1814 often showed Nehem, though numerous maps did not. The source is the Journal of the Book of Mormon and Restoration Scripture, vol. 17, no. 1, pp. 40-57, 2008. I am not aware of any evidence that these maps were accessible to Joseph Smith. I have searched many sources and others have, too. Details are discussed in "Joseph and the Amazing Technicolor Dream Map: Part 1" and "Part 2." Even if he did gain access to them and to all the writings available on Arabia, the sketchy information would not have enabled anyone to fabricate the details of Nephi's accurate description of travel through the Peninsula and the discovery of Bountiful. Say, here's a fun challenge: give any pre-1830 map of Arabia to a friend and ask him or her to construct a plausible path from Jerusalem to a fruitful place on the ocean for an ancient group of travelers. See what they can come up with, and compare it to reality and the Book of Mormon. The Arabian peninsula evidence for Book of Mormon authenticity is fascinating, though many will still dismiss it. If I asked you to write about a journey across Tasmania or through Bhutan or some other place about which you knew little, could you possibly describe a journey and its course in a way that would gain credibility with time? Is there any chance that you could even describe a reasonable general direction to travel? Could you pick a route that would later comply with routes used by others in the area? Could you name a site and over a century later have others find a map with a similar name at that place? Could you describe an unusual place that seems entirely out of line with what little you and others knew about the area, only to have others later discover an excellent candidate for that location in a place entirely consistent with the course you describe? To me, this is one of literally hundreds of "mundane" confirmations of the Book of Mormon as an authentic ancient document. The only logical explanation for the account of Lehi's journey is that it was written by people who traveled through the Arabian peninsula, and that means Joseph Smith did not write it. We are talking about a real ancient document that speaks to us from the dust (Isaiah 29) and confirms that Jesus is the Christ. I highly recommend Warren Astons' 2015 book and the earlier In the Footsteps of Lehi. The detailed treatment, the extensive documentation, the careful consideration of numerous issues, including ocean currents for the ocean voyage eastward, for example, and the personal description of the Astons' adventures make these outstanding resources and truly enjoyable reads. And much of the information is relevant even if Wadi Sayq is not the actual Bountiful of Nephi. I have asked many critics of the Book of Mormon to explain how Joseph Smith could have fabricated something so "laughable" yet so amazingly accurate as the place Bountiful and the burial place Nahom. No one so far has attempted a serious explanation. Recently, though, the Tanners have attempted to undermine the Astons' work by suggesting that Mormon scholars are contradicting themselves (Jerald and Sandra Tanner, Answering Mormon Scholars , Salt Lake City: Utah Lighthouse Ministry, 1996, reviewed by Matthew Roper in "Unanswered Mormon Scholars," FARMS Review of Books , Vol. 9, No. 1, 1997, pp. 87-145; for more information on the amazingly weak response of the "best" anti-Mormons to the Arabian Peninsula evidence of authenticity, see Scott Pierson's page on the Tanners' response--which also features a useful map and other supporting information). Citing the earlier and now outdated work of the Hiltons, who proposed an alternative site for Nahom before the exciting discoveries of Nehem and Wadi Sayq, the Tanners make much of the Hiltons having proposed a different place than the site Nehem. Since the two sites are 350 miles away, we are supposed to shake our heads and dismiss both due to the apparent contradiction (p. 181). Such arguments are utterly irrelevant, for the earlier tentative work of the Hiltons has been entirely superseded by more recent discoveries. The Tanners try to explain away the correctness of the routes described in the Book of Mormon by suggesting that some books in the 1830s did speak of a fertile region in southern Arabia. That argument can't even come close to explaining the direct hit on Nahom, which is not mentioned in any known sources available in 1830. The sources the Tanners refer to, the works of Jedidiah Morse, speak of Arabia Felix, a fruitful place, on the eastern shore of the Red Sea, in the southwestern part of the Arabian peninsula. Morse indicates that the rest of the Arabian peninsula was barren. Even if Joseph Smith had access to his works (anti-Mormon critics are retroactively creating an ever growing library for the farm boy Joseph! ), that would do nothing to explain how Joseph Smith could successfully locate Bountiful on the southeastern shore of the Arabian peninsula, far away from the Red Sea. Nahom, near the southwestern part of the peninsula, was far from a Bountiful-like place, but was a place of sorrow and mourning and severe hunger (1 Nephi 16:39). S. Kent Brown provides information about what was available from ancient writers about Arabia and the incense trail in his article, "New Light from Arabia on Lehi's Trail" in Echoes and Evidences of the Book of Mormon, ed. D.W. Parry, D.C. Peterson, and J.W. Welch (Provo, Utah: FARMS, 2002), pp. 55-125, with pages 69-76 and 118-119 being especially relevant. As of 1830, for example, neither the Manchester library nor the Dartmouth College library had any classical or contemporary works dealing in any detail with Arabia (ibid., p. 75). Even if Joseph had been a voracious bookworm with a huge library at hand, there is simply no way he could have generated the accurate details in the Book of Mormon based on what was available in print in the 1820s. Brown's article also adds many other dimensions to our appreciation of the Book of Mormon, showing that the Dhofar region of southern Oman has the features described in 1 Nephi, including the honey mentioned in 1 Nephi 17:5. If the Book of Mormon is to be explained away, it won't do to simply deal with the weakest evidences for authenticity and the incompletely answered questions. The strongest evidences must also be considered. I consider the "direct hits" in the Arabian Peninsula to be among the strongest intellectual evidences for authenticity, though many more continue to emerge. Theories that make the Book of Mormon to be a mere product of nineteenth century knowledge are immediately undermined by consideration of the Arabian Peninsula evidences (along with chiasmus, Hebraisms, metal plates and scriptorio, warfare in the Book of Mormon, and many other issues). And even if a library nearby had such a book, we know that Joseph was not a bookworm, but was a poor farmboy largely engaged in manual labor prior to the Restoration. Of his family situation, Joseph said that "it required the exertions of all that were able to render any assistance for the support of the Family therefore we were deprived of the bennifit of an education suffice it to say I was mearly instructid in reading writing and the ground rules of Arithmatic which constuted my whole literary acquirements" (D. C. Jessee, Editor, Papers of Joseph Smith , vol. 1, p. 5). His mother also affirmed that he was "much less inclined to the perusal of books than any of the rest of our children" (History of Joseph Smith by His Mother Lucy Mack Smith, edited by P. Nibley , p. 82). I find it interesting that the critics charge that Joseph was so ignorant and uneducated that he would not know that the birthplace of Jesus Christ was Bethlehem, while on the other hand they claim that Joseph was so well versed in the books of the world and the Bible that he could plagiarize and integrate from many sources to create a fraud so clever that it can fool highly educated people to this day with such subtleties as chiasmus, the correct locations for Nahom and Bountiful, and many other aspects that demand respect. But the fact is, they still have no remotely plausible explanation for how Joseph could have fabricated First Nephi. The Debate Around Arabian Locations. Valuable information on the plausibility of Nephi's journey through Arabia is provided in the new book by George Potter and Richard Wellington, Lehi in the Wilderness (Springville, Utah: Cedar Fort, Inc., 2003), which is a highly significant work, even if some of the specific sites identified end up being surpassed by other candidates. Yes, there is a healthy debate going on over which sites are the most likely sites for several scene in the Book of Mormon. As part of the healthy quest for understanding among LDS thinkers, there have been criticisms offered against some of the proposed sites identified by Potter and Wellington. The contrarian side is found in "The Wrong Place for Lehi's Trail and the Valley of Lemuel" by Jeffrey R. Chadwick (FARMS Review, Vol. 17, No. 2, 2005). Potter and Wellington remain in the strong position of having done actual fieldwork in Arabia, and Chadwick's proposed candidate for the Valley of Lemuel seems problematic in comparison, being a dry, barren valley without the river of water Potter and Wellington have found. Further clarity came when Kent Brown reviewed candidates for the Valley of Lemuel. Wadi Tayyib al-Ism proposed by George Potter based on his field work stands as the most plausible candidate. It also gets mentioned with a photo in an article for the New Era, "Was Lehi Here?" by David Edwards. Chadwick, however, score some important points such as the apparent lack of a "mouth" for the River Laman, an issue which I feel has now been addressed in my 2016 article on Lehi's Trail, "Joseph and the Amazing Technicolor Dream Map" at MormonInterpreter.com. Modern critics with far more education and knowledge of the Arabian Peninsula than Joseph Smith ever had have scoffed at the Book of Mormon's description of the impressive Valley of Lemuel with its "river, continually running" into the Red Sea (1 Nephi 2:9-10). "Everyone knows" that there are no such rivers -- yet a highly plausible candidate for exactly such a place exists. The story repeats itself with the place Bountiful, where initial mockery at the preposterous, uneducated fabrication of Joseph Smith was followed by relative silence in the face of impressive evidence that such a place may be plausible after all. The critics were initially fairly silent or managed to nitpick at details or differences in views between LDS scholars, many of which have been resolved with the recent work of Aston in his 2015 book, Lehi and Sariah in Arabia. Now if the Book of Mormon were completely fabricated based on what Joseph could glean about the world from upstate New York in the late 1820s, would we now have the luxury of discussing which actual wadi in Arabia best matches the textual details for the Valley of Lemuel and the River Laman? Or would we be discussing the impressive merits of one candidate for Bountiful versus another, as we see below, when "everyone knows" (until recently!) that no such place could possibly exist? It should give one pause, at least. George Potter and Richard Wellington's recent book, Lehi in the Wilderness (Springville, Utah: Cedar Fort, Inc., 2003) provides many interesting insights into Book of Mormon issues in the Arabian Peninsula, but it suffers from some flaws. The authors offer tantalizing finds, but in spite of their field work and abundant photographs and maps, they may have made some serious errors at the beginning of the path they identify. While their candidate for the Valley of Lemuel and the River Laman seem impressive, there is a good case that it is too far from the shores of the Red Sea and that the path required to reach it is implausible, as is discussed in the review, "The Wrong Place for Lehi's Trail and the Valley of Lemuel" by Jeffrey R. Chadwick (FARMS Review, Vol. 17, No. 2, 2005). Chadwick proposes that Bir Marsha, a place easily accessed from the coast of the Red Sea and not distant from Potter's candidate, may be more suitable for the Valley of Lemuel, though there may be several other good choices. As for the River Laman, Chadwick believes that it only need have been a wadi flowing with water at the time of Lehi's sermon to his sons, and that it need not flow continuously. Lehi said that it ran continuously to the Red Sea, not that it flowed continuously, and this can be fulfilled by a path for a wadi that goes into the Red Sea, regardless of how often the path has flowing water. Around the region of Nahom, the authors are on more solid ground. I am also intrigued with their discussion of the place Shazer that corresponds to a specific location along the ancient incense trails, as does Nahom. Numerous details of the journey described in the Book of Mormon are consistent with the terrain and the ways of ancient voyagers through the Arabian Peninsula. Potter and Wellington provide a wealth of information that adds insight to Lehi's travels and to the circumstances of his group at various stages of their long sojourn. The authors then trace Lehi's probable path from Nahom eastward to the coast of Oman, and offer an interesting but possibly incorrect candidate for the place Bountiful (see "Warren Aston on the Superiority of Khor Kharfot as a Candidate for Bountiful"). Here they depart from the much publicized Wadi Sayq as a candidate for Bountiful, preferring instead the region of Dhofar about 60 miles to the north, and specifically the port region of Khor Rori. Even if some parts of their analysis are wrong, the general information about the Arabian Peninsula strengthens the case for the plausibility of First Nephi in the Book of Mormon. Regardless of which candidate is selected for Bountiful, there are many factors that supporting the record in First Nephi as an authentic ancient Semitic record from someone who actually made the journey from Jerusalem to the eastern coast of Oman. In spite of some possibly serious errors, Potter and Wellington's book is a valuable contribution. It is available at NephiProject.com. Also see my Book of Mormon Nugget, "The Place Shazer" and Rex Jensen's "Where Did Nephi Build His Ship?" Take a look at Warren P. Aston's article in the March 2013 issue of Wildlife Middle East (vol. 6, no. 4, March 2013). Warren's article, "Arabia's Hidden Valley: A Unique Habitat in Dhofar Captures Arabia's Past," does not mention the Book of Mormon or LDS issues, but the site he treats in his secular article is a leading candidate for ancient Bountiful. The article includes photos of the Khor Kharfot site at the mouth of Wadi Sayq, and also discusses biodiversity in this region. Photos of native figs and dates are included, as are some photos of the large freshwater lagoon that would have been a big part of why a weary band of travelers might call that spot Bountiful. Knowledge of the biodiversity there helps us better appreciate what Lehi and Nephi may have found, though some things have certainly changed since 600 B.C. Also see FAIRMormon.org's page on Book of Mormon geography in the Old World for a good overview of the development of proposed routes for Lehi's group through the Arabian Peninsula. 5 And he came down by the borders near the shore of the Red Sea; and he traveled in the wilderness in the borders which are nearer the Red Sea; and he did travel in the wilderness with his family, which consisted of my mother, Sariah, and my elder brothers, who were Laman, Lemuel, and Sam. 6 And it came to pass that when he had traveled three days in the wilderness, he pitched his tent in a valley by the side of a river of water. 7 And it came to pass that he built an altar of stones, and made an offering unto the Lord, and gave thanks unto the Lord our God. The critics chuckle that there are NO RIVERS flowing into the Red Sea, at least not anything that could be said to be "continually" flowing. Sure, a few wadis might get a momentary trickle during a rainstorm, but nothing that could be the basis for Lehi's lecture to Laman. Yet the Book of Mormon has Lehi and his family stopping in an impressive valley with a river that continually (year round?) flows into the Red Sea. Slam dunk for the antis? No way! A 35 minute video, Discovering the Valley of Lemuel, filmed entirely on location, can be ordered. Could Potter's small stream, shallow and just a few feet wide, at most, qualify as a river? In the published article, Potter notes that there are several Hebrew words which could qualify as the "river" of 1 Nephi 2, most of which refer to any running stream. They could also refer to seasonal waterways, such as the "River of Egypt," which is Wadi El-Arish, a wadi that fills only after storms (see Anchor Bible Dictionary, 1992, Vol. 2, p. 321, 378). Or it can refer to large rivers like the Euphrates. The small stream found by Potter keeps vegetation green and healthy even when there has been no rain for months. It flows continuously, in spite of being reduced in volume by pumping upstream for use at a coast guard post and by many motor-driven pumps in the area tapping into the aquifer that is the source of the spring. In fact, it appears that the stream once had much greater flow, for there is heavy erosion of the lower canyon walls and water-laid calcite deposits on the valley floor that can be as wide as 15 to 20 feet, much wider than the stream. The river currently descends into rocky rubble as it approaches the Red Sea. According to Dr. Wes Garner, a retired geologist from King Fahad University of Petroleum and Minerals in Saudi Arabia, movement of the continental plates has caused the canyon to rise significantly since Lehi's time--the rocky place where the stream disappears as it approaches the Red Sea was previously submerged. Lehi probably would have faced a larger river that visibly flowed into the Red Sea. The shady canyon and the stream of fresh water, originating from a spring, would have provided welcome relief to the travelers and undoubtedly would have been a place where the voyagers would camp and recharge. They may have stayed here long enough to learn that the river really does flow continuously, though they may have inferred that based on the green vegetation supported by the river. How about the location? The Book of Mormon text appears to say that Lehi and his family traveled for three days in the wilderness after the reached the Red Sea (after "he came down by the borders near the shore of the Red Sea"). Is the candidate for the Valley of Lemuel in a reasonable location to match the text? Yes--it's 70 miles south of Aqaba--that's the land distance that must be traveled by foot (or by camel), not the distance along a straight line. That's a plausible but challenging distance on foot for three days travel, and a piece of cake by camel. Potter provides photos, a map, and detailed directions on how to get there. More remains to be learned about this amazing site--but it must be regarded as another powerful and verifiable piece of evidence supporting the plausibility of the Book of Mormon. An anti-Mormon laughingstock has become one more piece of evidence for them to ignore. Meanwhile, skeptical anti-Mormons are encouraged to head off to Arabia as quickly as possible to see for themselves. (And, for a refreshing change of pace, be sure to try a little anti-Muslim evangelizing while there.) Others wishing more information are encouraged to purchase the video. Most of the arguments against the Book of Mormon are arguments of silence. According to the critics, since something in the Book of Mormon has not (yet) been found, it must not exist, making the book false. But these arguments of silence have a tendency of crumbling before the voice of data. Modern ignorance about remote places and ancient peoples continues to erode, leaving the foundation of the Book of Mormon exposed as a solid fortress rising above the plains of doubt. Oh, yes--we're just in the infancy of knowledge here. Almost none of the likely candidates for Book of Mormon sites in Mesoamerica have been carefully excavated. Many more discoveries await us--be patient! For now, though, consider John Sorenson's latest work, Mormon's Codex (Provo: Neal A. Maxwell Institute, 2013). See the text from his presentation, "Reading Mormon's Codex" from the FairMormon 2012 Conference. Absolutely laughable in 1830, now not only well established as an ancient practice, but as a particularly significant ancient practice in the Middle East in the era of 600 B.C.--especially for religious documents. Many new insights have come to light in recent years. For example, a 2014 news story from LiveScience.com reveals that a newly translated ancient Hebrew document may point to a tradition of preserving important texts by writing on metal. See my discussion at Mormanity, "An Ancient Tradition of Writing on Metal? Surprise (?) from a Newly Translated Ancient Hebrew Text." Etruscan gold plates dating to 600 B.C. Another recent news item is that ancient book of gold plates was discovered! See the BBN News article from May 26, 2003, "Unique Book Goes on Display." This volume of gold plates, bound with gold rings at the side as was the Book of Mormon plates, comes from the ancient Etruscans, who had origins in the Middle East (Turkey) and were wiped out by the Romans in the 4th century B.C. 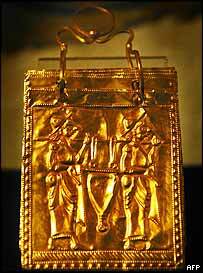 Also see the related story from May 23, 2003, "World's Only Etruscan Gold Book Added to Bulgaria's Archeology Treasures." H. Curtis Wright, "Ancient Burials of Metal Documents in Stone Boxes: Their Implications in Library History," The Journal of Library History, Vol. 16, No. 1, Libraries & Culture I (Winter, 1981), pp. 48-70. See also the related and expanded document, H. Curtis Wright, "Ancient Burials of Metal Documents in Stone Boxes," By Study and Also by Faith, vol. 2, ed. Stephen Ricks (Salt Lake City: Deseret Book, 1990). Also see vol. 1. There is also a PDF available at BYU.edu if you want to see a photograph in the printed version. One significant issue is the ancient practice of "scriptorio"--putting the title page at the end of the book, a hallmark of ancient writings on plates from the Middle East and evidence of authenticity for the Book of Mormon. Joseph Smith could not have known of "scriptorio" when he translated the gold plates and noted that the title page was at the end, on the last page. For details on this important external evidence, see my page on "Metal Plates and the Book of Mormon", taken from a FARMS Update (in compliance with their "fair use" policy). Also see my Book of Mormon "Nugget," "Hiding Sacred Records like the Golden Plates: A Well Established Ancient Practice," and my LDSFAQ page on Metals in the Book of Mormon. It's interesting to see the critics moving away from mocking the very concept of writing on metal places to now saying that it was obvious and Joseph could easily have come up with that idea on his own (see the related Mormanity post or Book of Mormon Nugget #25. Where did Joseph Smith get the idea of ancient records on metal plates hidden in a stone box that was buried in the earth? Critics mocked this for decades--until many other examples of ancient records preserved on plates or in stone boxes were found. In our day, scholars know that there is a vast ancient tradition pertaining to preserving sacred records by concealing them for some future time. Some of this evidence is brought together lucidly in John A. Tvedtnes, The Book of Mormon and Other Hidden Books (Provo, Utah: Foundation for Ancient Research and Mormon Studies, 2000). Also see my Book of Mormon "Nugget," "Hiding Sacred Records like the Golden Plates: A Well Established Ancient Practice." It turns out that this practice of concealing records "is most prominent in the ancient Near East, the land from which the Book of Mormon people emigrated to the New World. The practice of concealing records in stone boxes is also well attested in the ancient world and was still being practice in Moroni's day. And the use of metal for preserving sacred records is also attested, particularly in the ancient Near East. Joseph Smith could not have known all of this (though some basic concepts were known before 1830 - see "Those Implausible Plates" at Mormanity for a discussion), and his early critics had no clue either (and many modern critics still remain blissfully unaware of the extensive discoveries in this area). How, then, if the Book of Mormon is a forgery, did Joseph manage to be so lucky as to make up a story that fits ancient patterns so well? The way covenants were made in the ancient Middle East are much different than the way we do treaties or contracts today. It was only a few decades ago that scholars, after studying newly translated documents from the ancient Hittites and others, began to piece together a common pattern found, at least partially, in many ancient covenants, including Old Testament covenants. I won't get into the fascinating relationship to LDS temples here, but I will note that these patterns can be found as well in the temple-related sermon of King Benjamin in Mosiah 1-6, an episode where Benjamin speaks from the Nephite temple and brings his people into a covenant to follow Christ, the promised Messiah. For details, please see Stephen D. Ricks, "The Treaty/Covenant Pattern in King Benjamin's Address (Mosiah 1- 6)," BYU Studies, vol. 24, no. .2, Spring 1984, pp. 151-62. Also see Stephen Ricks, "Kingship, Coronation, and Covenant in Mosiah 1-6," in King Benjamin's Speech, ed. John Welch and Stephen Ricks, Provo, Utah: FARMS, 1998, pp. 233-275. Also see my related post on Mormanity. I don't think the elements of the ancient covenant formula can be pieced together just by being familiar with the King James text, though once identified by scholars with the help of other ancient documents, we can see it in the Bible. To me, the ancient elements of King Benjamin's speech as well as the LDS temple cannot be explained by Joseph just absorbing and regurgitating what he was exposed to. There's a whole online book on the topic, the previously mentioned King Benjamin's Speech, edited by Welch and Ricks. The Book of Mormon has long been criticized for its description of an ancient Hebrews who spoke of Christ and had Christian practices like baptism long before the coming of Christ. In fact, it begins with a vision of Lehi, a rebel prophet in Jerusalem, who has visions of God, Christ, and heavenly beings. In the Book of Mormon, the message of Christ was not new to the world but was a restoration of ancient truth focused on the Son of God as the Messiah. Such concepts have become more plausible in recent decades. Some of the early relevant evidence comes from the Dead Sea Scrolls, where we learn of early Hebrews actively looking forward to a Messiah and engaging in practices similar to baptism, showing that a "church of anticipation" outside the mainstream ranks of Judaism was possible, and showing that some aspects of Christianity had more ancient roots than previously recognized. The Dead Sea Scrolls also showed that a community of Hebrew believers steeped in concepts such as ongoing revelation was possible. For some of the first LDS insights on this topic, see Hugh Nibley, "The Dead Sea Scrolls: Some Questions and Answers" and Hugh Nibley, "From the Dead Sea Scrolls (1QS)" in Studies in the Bible and Antiquity, vol. 2 (Provo, Utah: Maxwell Institute, 2010): 83-104. More recently, see Stephen Ricks, "The Book of Mormon and the Dead Sea Scrolls" in LDS Perspectives on the Dead Sea Scrolls, ed. Stephen D. Ricks (Provo, Utah: Maxwell Institute, 1997). Margaret Barker, "What Did King Josiah Reform?," in Glimpses of Lehi's Jerusalem. Margaret Barker, Temple Mysticism, (London: Society for Promoting Christian Knowledge, 2011). Also see Kevin Christensen's review at MormonInterpreter.com. Kevin Christensen, "Nephi, Wisdom, and the Deuteronomist Reform," Insights, 23/2 (2003). Kevin Christensen, "The Deuteronomist De-Christianizing of the Old Testament," FARMS Review, 16/2 (2004). Kevin Christensen, "Jacob's Connections to First Temple Traditions," Insights, 23/4 (2003). Kevin Christensen, "Nephi, Wisdom, and the Deuteronomist Reform," Insights 23/2 (2003): 2-3. David E. Bokovoy, "The Spirit of the Lord as Council Witness in 1 Nephi 11," Interpreter: A Journal of Mormon Scripture, 1 (2012): 1-23. Jeff Lindsay, "Ancient Temple Themes in the Book of Mormon," Mormanity.blogspot.com, Dec. 20, 2013. There is so much in the Book of Mormon that makes a lot more sense today than it did 150 years ago or even 30 years ago. An understanding of the prophetic traditions from the early days of Judaism and even among the later Dead Sea Scrolls community gives us much to appreciate. If you've read the Book of Mormon already, go back and read First Nephi again, but with the perspective we gain from Barker's work and the prophetic traditions of Israel's visionary men. There is an abundance of new evidences in favor of the Book of Mormon in this field. Genes Linking Eurasians and Native Americans? In my article, I point out that there are genes found in Native Americans that are also found in Jews, including mitochondrial DNA haplotype X (found among some Israelis and Europeans) and a Y chromosome haplotype called "1C". These genes can also be found in Asia, and so don't prove that people from the Middle East came to the Americas--but that possibility most certainly is NOT excluded by the DNA evidence. Other data may point more directly to Middle Eastern origins for some of the many genes in the Americas, including an analysis of ancient skulls from the Americas and HLA genes. But even without the discovery of such evidence or of the possibly relevant DNA haplotypes, a proper understanding of what the Book of Mormon actually says and what the scientific data actually say rapidly leads one to the conclusion that the DNA-based attacks on the Book of Mormon are without merit. The scientific data may challenge some popular misinterpretations of the Book of Mormon, but they do not challenge the text itself. For details, see "Does DNA evidence refute the Book of Mormon?" In spite of the popular "Asia only" paradigm for Native American origins, evidence for ancient transoceanic contact exists and the Bering Strait theory may not explain the origins of all ancient Americans. I discuss transoceanic contact and the Bering Strait in my page on the Smithsonian Institution's 1996 Statement Regarding the Book of Mormon. Exciting, no? But as I explain in a post at Mormanity, we should not get too excited about this report. There are many questions and puzzles yet to explore, and the linkages found may have nothing to do with genes from Nephi's group in 600 B.C. However, this recent scientific finding certainly helps weaken what once seemed like a powerful attack against the Book of Mormon. For more information, see "Reformed Egyptian" by William J. Hamblin, The FARMS Review, 19/1 (2007). Also see "Jewish and Other Semitic Texts Written in Egyptian Characters" by John A. Tvedtnes and Stephen D. Ricks, Journal of Book of Mormon Studies , Vol. 5, No. 2, 1996. And for fun, be sure to see the site, Ancient Scripts--a marvelous collection of information on scripts of the ancient world. Update: The FARMS publication, Insights, in Feb. 1998 reported on presentations at the annual meeting of the American Academy of Religion (AAR) and the Society of Biblical Literature (SBL), held Nov. 1997 in San Francisco. Non-LDS scholar Nili S. Fox discussed the development of Egyptian hieratic numerals used in Hebrew texts by Israelites during the ninth through seventh centuries B.C. Fox noted that the Israelite scribes were acquainted with the Egyptian writing system and that there was a longer history of ties between Egypt and both Judah and Israel than previously thought. Hebrews using an Egyptian writing system? The idea is a lot more plausible today that it was in Joseph Smith's time.